At the beginning of this class, I was expecting to learn how to produce different types of media. I was very interested in photography and video production. I got to learn the basics of several different types of production, but I wish I could’ve learned more details on a few of them. I learned how to look at things from different perspectives. In the photography assignment I had to think of an aspect of my life that could be taken from two different perspectives. I also learned how to listen and have empathy during the audio assignment. These skills will be helpful in my future career of communications because they will allow me to produce original material that can appeal to multiple audiences. I have gained experience in communicating with my peers and problem solving that will help me work with others in my career. My favorite assignment was the audio blog. I interviewed someone special in my life and got to help tell their story. I enjoyed editing and putting a story together that brought to life their adventures. I was worried about editing at first, but once I got the hang of it, I really liked it. The assignment I enjoyed the least was photography. I was expecting to love it, but it was much harder than I thought. The specifications of the assignment was really hard to follow because I don’t like taking pictures of people. All of the things I enjoy in my life don’t have anything to do with people. I wish that I could’ve gotten the chance to take more pictures of things that I enjoy. My favorite cow sniffing my camera. If I could give myself advice, I would say to carefully read the instructions and make sure you’re following them exactly. There were a few assignments that I didn’t understand the instructions or had a hard time producing something that followed them exactly. I enjoyed this class, but I wish it was more in depth. I understand it’s difficult to find someone that is proficient in all the different types of media, but I feel like it would have been more beneficial to learn fewer things to a greater degree. Cowboy Joe is the official mascot of the University of Wyoming and the College of Agriculture and Natural Resources. He is a seven year old Shetland pony and is the fifth pony to serve as the mascot. Joe goes to all of the home football games and can be seen in parades throughout the state and region. There are four handlers that showcase Joe and take him to all of his events. I have been a handler for a year and love sharing his story. My partner and I thought it would be great to promote him and tell a short history about him. I really enjoyed videoing Joe during some of his usual events. I am usually on the other side of the camera, so it was a lot of fun to experience this side. I’m very comfortable with the handlers and felt like I could be awkward in front of them to get good footage. One thing I didn’t enjoy was using my phone to record. It didn’t capture the quality I was hoping for and I didn’t get any sound on my videos. I wish I could have gotten to play around with a more advanced recording device. Despite all of the lectures and advice on getting plenty of footage, I was still surprised at how much it takes to make a two minute video. I really wish I could go back and get more footage. I also wish I could have gotten different angles. I had a lot of video, but it was all very similar. I also wish I would have noticed that none of my videos were capturing sound. I think I could potentially use video a lot in my career. Videos are becoming very popular for promotional marketing and advertising and would be great for the Ag industry. I could also use these skills to video cattle and other animals for sales. Social media has recently gained a lot of popularity and is becoming a main source of information. Businesses and companies are relying more on social media for advertising and promotion more than ever. However, there are a lot of organizations that aren’t using social media to the best of its ability and may be losing followers. This post will analyze and compare two rival companies’ social media accounts to learn which is more effective. Murdoch’s Ranch and Home Supply logo. Photo courtesty of Murdoch’s.com. Tractor Supply Company logo. Photo courtesy of TractorSupply.com. There are very few companies geared specifically toward agriculture. Therefore, many ranchers and farmers rely on the few businesses that carry the supplies they need. I chose to evaluate Murdoch’s and Tractor Supply because I have grown up using them and they are important to the agricultural community. I enjoy going to Murdoch’s in Laramie because I can get clothes and supplies all in one place. My family uses Tractor Supply because there is one a lot closer to home. Both companies had a strong presence on Facebook. Each company was easy to find, and a lot of specific locations had their own page as well. Tractor Supply posted at least once a day and they are very interactive with their followers. They ask them to post their own pictures in the comments, or to share with their friends. Neither of the companies do a lot of product promotion and focus more on connecting with the consumer on a personal level. Most of the posts feature children or cute animals to grab attention. They both show their appreciation for their employees, as well as the consumers, by sharing humanistic stories. Overall, they use Facebook to reinforce brand loyalty. As far as Twitter, Murdoch’s has very similar content to its Facebook page. Most of the posts are the same material on both sites. I don’t think that Tractor Supply has a functioning Twitter account. When you search their handle, the page says that it’s coming soon, but that it was also created in 2012. I don’t foresee it becoming active any time soon. The Instagram account for Murdoch’s is full of cute puppies and other various baby animals. It has less informative posts than its other social media pages and focuses on simply on the picture. It’s most common hashtag is #Murdochs. Tractor Supply’s Instagram has more product features and customer stories, but they also include a healthy supply of cute animal pictures to grab their attention. Adorable puppy post encouraging customers to shop at Murdoch’s. Photo courtesy of Murdoch’s Instagram page. I don’t have a Pinterest, nor do I have any desire to get one. That being said, I don’t understand how the site works or what the purpose is. I was able to find both companies and scroll through their content, and it seems to be fairly consistent with their other pages. They are sticking with their target audience well. Both companies had a presence on Snapchat. I saw pictures of baby chickens, isles of dog food, and what the customers were enjoying in the store. It definitely targeted the younger audience that uses Snapchat by having videos and colorful text. Murdoch’s had a page on LinkedIn and a story about themselves. However, they didn’t have any posted content or other information. Tractor Supply had a lot of hiring information and job postings available to look through. Based on my findings, I would say Murdoch’s is using social media in an effective way. First, they have a very clear target audience. All of their material can relate to their customers in some way or another. Second, their material does a great job of catching your attention. They use a lot of pictures and graphics that stand out and grab you as you’re scrolling. You can’t go wrong by posting pictures of adorable puppies. In class, we read an article about how Under Armour keeps their advertisements very short and simple to catch their readers attention before they move on. I think Murdoch’s is doing that well. Third, they don’t do a lot of actual advertising or product featuring. I think most people are bombarded by ads and tend to gravitate away from them. Murdoch’s focuses more on featuring the lifestyle and the people who live it. This creates a strong brand loyalty. There are a few ways that Murdoch’s could improve their sites. I was surprised that they had a presence on all of the social media pages, but I think it’s clear that they spend most of their resources on a few and are behind on others. Their Snapchat name didn’t have a lot of use and it didn’t seem to have one theme. I think they could try to target a younger audience by having more presence on Snapchat. Another thing I would suggest to improve is broadening their material. They have a limited kind of posts that they use all the time. They may be able to reach a broader audience if they implemented more videos and live feeds according to an article about growing your business. My last piece of advice for Murdoch’s is to have more relevant posts. A Forbe’s article about using social media suggests creating material that is current and can reach your audience in a different way. They could take articles from the news and use them to promote their brand and ideals. I think Tractor Supply does a great job of expanding their followers and creating an image that people recognize. They have a good number of followers and all of their pages are familiar and have a consistent theme. They also do a good job of posting helpful articles. According to Forbe’s, posting helpful or instructional material can help boost followers. Tractor Supply also posts frequently and keeps their pages updated and current. This allows them to show up more often in your feed. This post is informative and calls the audience to action. Photo courtesy Tractor Supply’s Facebook page. I would suggest that Tractor Supply fixes or starts their Twitter account. I think they could have a lot of followers and reach new customers with it. I think they should also try incorporating more relevant news stories to reinforce their brand and what the company stands for. My last piece of advice would be to have a stronger presence on Snapchat. They are very similar to Murdoch’s in that their consistent image doesn’t follow them onto Snapchat. They could reach a younger audience by increasing their activity. The main thing that sticks out in my mind from Anna Raider’s lecture was how she basically created her position. She was interested in an internship that didn’t exist, so she asked how she could get it started. A lot of companies don’t have a social media presence or one person in charge of running it. Social media has grown so much and has a large influence on Public Relations and advertising. It’s important for businesses to take it seriously and use it to their advantage. Jessica Romero talked a lot about keeping your brand consistent to create loyalty with your customers. Try to give all your pages a similar look and feel so that your followers feel like they know you. It’s important that people trust your brand and feel like they understand your values and ideals. I think that both of the companies I evaluated did a good job of this and have kept their images consistent. Are you looking for an authentic western vacation or summer getaway? Wyoming is the perfect place to bring your family and experience what the Wild West is all about. From beautiful mountains, to vast plains, Wyoming’s scenery is sure to take your breath away. There is also rich history and a rare western culture to be found. A dude ranch is the ultimate way to experience authentic Wyoming adventure. There are over 20 ranches throughout the state that each offer a unique look at the cowboy life. 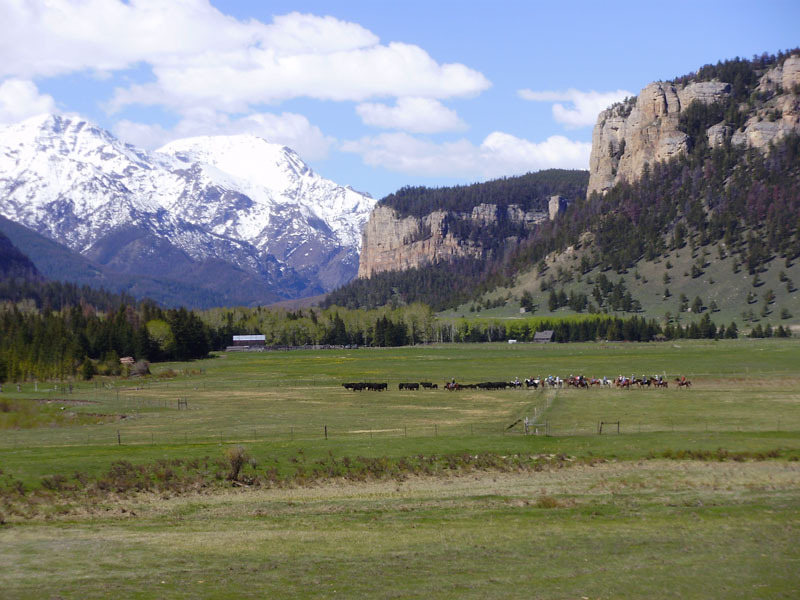 I have picked my favorite 5 dude ranches that are sure to let you live your Wyoming dreams. So grab your hat and boots and saddle up for this wild ride! The guest horses grazing on the lawn in front of the lodge at the Vee Bar. Photo courtesy of duderanch.org. This beautiful ranch is settled down on the Laramie River just outside of Centennial, WY. It’s located in the shadows of the Snowy Mountains and overlooks the Laramie plains. This ranch offers plenty of horseback riding opportunities, along with other outside activities. You can hike to Medicine Bow Peak, fish in the Laramie River, and try your hand a shooting a shotgun. My favorite part of the Vee Bar is getting to trail cattle across the dusty plains, followed by a camp-out in the mountains. Live music and roasted marshmallows are sure to bring out your inner cowboy or cowgirl. This is a great place for the whole family to experience the West! “I love getting to teach the kids how to ride and bond with their horse. It’s great to see how families can really come together here,” said Vee Bar wrangler Tommy George. Guests on the Klondike trailing cattle home in the spring. Photo courtesy of Klondikeranch.com. If you’re looking for an authentic cowboy experience, the Klondike Ranch is the place to go! This is a historic cattle ranch that is still functioning today. Guests get to see how a real ranch works and pitch in on everyday activities that keep the ranch running. If you want to try your hand at something more advanced than trail riding, the Klondike in Buffalo, WY is perfect for you. The surrounding area is also very scenic and offers a rich history of Wyoming. “The ranch offers some great views and is located near some of the most historic cowboy towns in Wyoming,” said Wyoming native Averi Reynolds. A wrangler leads guests along a hill over looking the Grand Tetons on the Triangle X Ranch. Photo courtesy of Casper Star Tribune. Located in the heart of Grand Teton National Park, the Triangle X Ranch offers some of the best views in the state. The ranch is also a short drive from Yellowstone National Park. It’s a great place to take in Wyoming’s natural beauty while enjoying great hospitality and family fun. The ranch has been in the same family for five generations and counting. Along with horseback riding, the ranch offers great wildlife viewing, dancing, and fishing from the mighty Snake River. “They are great hosts and offer true Wyoming hospitality,” said working cowboy Conner Bailey. Guests moving cattle at the 7D Ranch. Photo courtesy of 7Dranch.com. The 7D Ranch offers a very personal and individual experience. They only take in a few guests at a time, which allows them to work one-on-one with each person. You are sure to be able to learn about authentic cowboy traditions at the 7D. 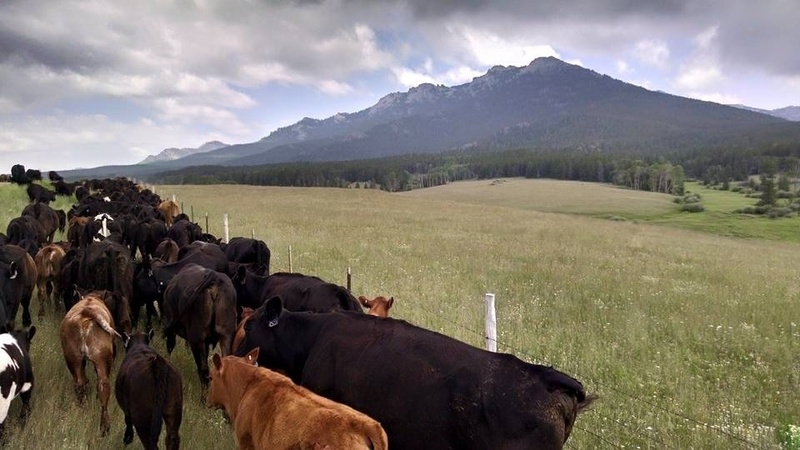 Nestled in the Absaroka Mountains near Cody, WY, this ranch is sure to offer spectacular views that are a well kept Wyoming secret. There is also the opportunity to see the famous Cody Night Rodeo during the summer. Wranglers leading a pack string into the Wind River Mountains. Photo courtesy of Wyohunt.com. This guest ranch offers a different kind of adventure for the wild at heart. 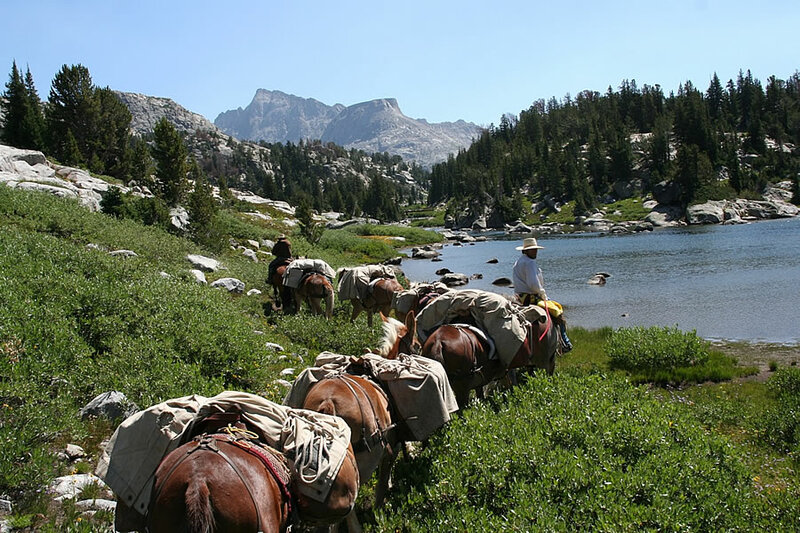 Allen’s Diamond 4 Ranch gives guests the opportunity to go on a pack trip into the wilderness with only their horse, tent, and the food they can carry. The wranglers serve as your guides and the mountains as your map. There are no restrooms, restaurants, or motorized vehicles on this trip. The wildlife can be seen up close and personal in their natural habitat. The ranch is a great way to see how rugged and wild Wyoming truly is. These 5 dude ranches are some of my favorite places in Wyoming. They are all beautiful and unique in their own ways. If you want to check out more of what the Cowboy state has to offer, visit Dude Ranches Association for a complete list of opportunities. I have interviewed people where I used a voice recorder before, but this was different because I wasn’t taking any other notes and I had a hard time not making any extra noises. I was pleased with how easy it was to edit the audio. I didn’t have any other experience with audio, but the program was simple to use and I enjoyed the results. There were a few times when I was frustrated because I had a part that didn’t flow well, and I didn’t know how to fix it. Once the audio is recorded, you can’t go back and add to it. I was surprised at how difficult it was to get the interview within the time specifications. I had to conduct the interview several times to get it to the right time. I wish that I had more questions prepared to choose from so that I could make the story flow more smoothly. I am very interested in using audio to capture the stories of my grandparents’ generation and sharing them with the world. I would like to use their stories to inspire my generation and to keep their history alive. I ventured out to the pasture to capture my cows enjoying their breakfast. The photo was taken at home in Lusk, WY on February, 16. I had to crawl on my hands and knees to get close to the cows, but their curiosity kept them interested in what I was doing. I learned that it can take a lot of shots to a good one. It also takes patience to wait for everything to line up the way you want, and it’s important to always watch for cactus! I used rule of thirds, color, and symmetry as creative devices. I journeyed to the local Starbucks today to find people who are different than me. I am not a big fan of coffee and I don’t know how to order from a Starbucks menu. I found a couple that were enjoying their coffee and conversation. They seemed to dress as if they were athletic and sporty. Although they were around my age, I would guess that they have different interests than me. This was a feature photo that used framing and contrast. I felt very awkward and a little creepy taking pictures of strangers, especially when they didn’t know I was taking pictures. I wish that I could’ve gotten a more creative angle or better lighting, but I didn’t want to blow my cover. I really wanted to capture a candid moment. I learned that you can’t be afraid to put yourself in an uncomfortable position to get a better shot. These photos show two different perspectives of food; preparing and eating. Photo three captures McKenzie Ventrello, Shelbie Sperle, and Avery Reynolds preparing and making cookies today. They are demonstrating the first step in the eating process by measuring and combining ingredients. Although this can be enjoyable to many people, it is often a lot of work. The creative device used in this photo is framing. Photo four shows Ryan Robinson enjoying his dinner after it had been prepared at Altitude on February, 10. Eating is often an enjoyable task that brings people together. I used different angles to create depth in this photo. Both photos were feature photos that I captured in the moment. I learned that photos tell a story and how you capture them can change how the story is told. Every issue or event has multiple sides if you are willing to look. I was surprised at how difficult it is to get a good shot of a subject. It requires a lot of photos to get one to turn out the way you want it. I thought that it would be easier to put what I had in my mind into the camera, but it took a lot to create what I was looking for. I wish that I could have been more willing to move around and get creative shots of people. I just didn’t want people to stop being natural because they knew I was taking pictures. As we enter the second month of the year, our New Year’s resolutions may be a cloudy memory of optimism and hope. For most people, it is very difficult to keep resolutions more than a couple of weeks. The excitement of the holidays and a much needed break have worn off, and we get caught up in our jobs once again. The image of that perfect beach body becomes second priority to work projects and household duties. After thinking about the money and time it takes to cook a healthy meal every day, the Taco Bell down the street begins calling your name. Although our intentions are in the right place, we often give in to the temptations that lead us astray. One of the most commonly dropped resolutions is going to the gym consistently. According to the Huffington Post, losing weight is the most common new years resolution, and also one of the hardest to attain. After all of the holiday treats, people are motivated to work off the extra pounds they have acquired. They may feel sluggish and tired after visiting their family and want to get back into a daily routine. The new year seems like a great time to start fresh and set goals for the upcoming months. However, completely changing your lifestyle and dietary habits can require more effort than most people realize. If you are a consistent gym-goer, you have most likely witnessed the increase in activity right around the first of the year. Morgan Rummel, a senior structural engineering student at the University of Wyoming, describes the chaos of students trying to fulfill their resolutions at Half Acre gym on campus. He says that it gets really crowded and hard to move around without running into someone. “There is definitely a big difference in the amount of people there, but most of them don’t stay very long,” Morgan said. Morgan isn’t the only one who notices the abnormal crowd. “On an average day we have around 2300 students come through the gym. On January 29, the first day of classes, we had 2711 students,” said Senior Accounting Associate for Half Acre Jennifer Heupel. She pointed out that the large increase happens on the first day of classes because people get lazy over break and want to get back into a steady routine. The jump in numbers isn’t only seen at the University. “We see a huge increase in members for a very short amount of time,” said Altitude Fitness employee Celsey Meyer. This increase always happens in January, but it doesn’t seem to last very long. At Altitude Fitness, the numbers drop down again as soon as February. Half Acre sees their decrease after Spring Break in March. Students do well at balancing school, work and a healthy lifestyle until the middle of the semester. “Students do good for a while, but midterms take priority and they get busy studying,” explained Jennifer. Resolutions may be harder to keep than most people think. It requires a lot of determination and dedication, especially in the gym. Only eight percent of people keep their New Year’s resolutions, according to Huffington Post. There may be many reasons that resolutions often turn into disappointing failures. Setting unrealistic goals and trying to achieve unattainable results can lead to dropping your resolutions in February, rather than keeping them all year. An article in the Huffington Post gives tips on how to make resolutions become lifestyle changes. Instead of trying to turn your life around in a short amount of time, take small steps that work up to your desired result. Make small incremental changes each day, and you will soon find that you can change your habits and take control of your life. “Start with something more attainable. Set smaller goals and work up to it,” suggested Morgan. He works out at least four times a week and says that it has to become a part of your daily routine. Tell yourself that it’s just another thing you have to do each day, and you will make it a habit. Setting resolutions is a great way to better yourself and reach your goals, however it may not be as simple as you think. Be prepared to put the work in and make a lifestyle change.